Within a small and charming residence lies the apartment in a panoramic position. Finished and furnished with taste and cheer the apartment offers guests the feeling of being at home. The house of about 100 square meters offers its guests: air conditioning, two bedrooms, one double and one with two single beds, two bathrooms including shower and two sofa beds in different rooms. The house is on two floors and offers a terrace overlooking the sea covered with a tent and a balcony overlooking the communal garden sea view and Etna, instead of property within the condominium. The residence has a private beach with showers and easy access to the sea with a ladder to descend into the water. 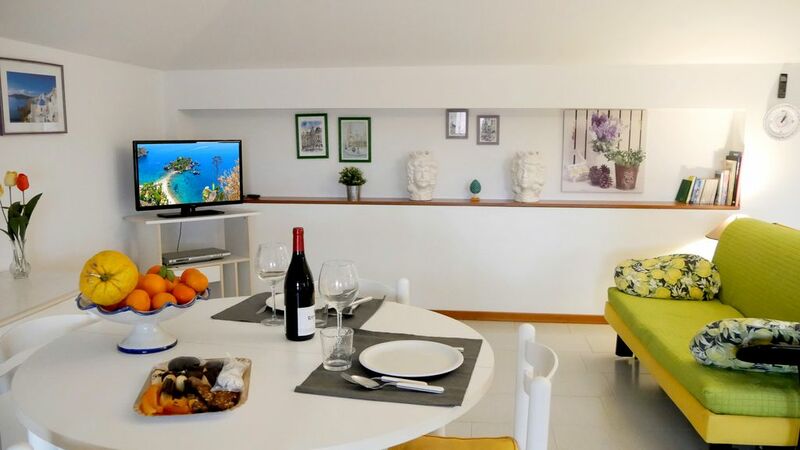 The apartment is located in the main street of a charming seaside village equipped bar, pizzeria supermarket, butcher, newsagent, bakery and restaurants where you can enjoy excellent fish. Children under three years old are free of charge. Check in: 16.00 - 23.00 Check Out: 08.00am. - 11:00 am The prices shown are inclusive of water consumption, electricity gas, and change of sheets and tablecloths weekly. In case of "excessive and irrational" electricity consumption, the deposit will not be returned in whole or in part. We spent 6 nights here and were very pleased with the apartment. It is right on the water, has wonderful views, and is just steps away from the water, accessed via a path along volcanic rocks, for swimming. In the upstairs bedroom you can lie in bed and look out directly onto the sea! Filippo was a great host he picked us up when we got lost looking for the place when we arrived. The place is very clean, light-filled, pleasant, and relaxing. The modest village where it is located has a bunch of nice restaurants with terraces looking out onto the sea. A great location for day trips to Etna or Taormina. Highly recommended. Thank you so much, Ciao! It was really great: the big terrace with a marvellous view to the seaside and fantastic sunrises in the morning, the bright and generous flat we used with 4 people, the really nice, friendly and helpful hosts, the closeness to the sea (though it was quite slippery to get across the rocks into the sea ;-), the possibilities to small supermarkets and good restaurants, the tiny little village itself... I´m sure we will come back!!! Thank you all !!!!!!!!!!!!! I am very glad that you enjoyed the apartment. We'll see you next summer!! It's really a wonderfull place for vacations. We spent there an unforgettable week in september. The apartement is beautiful, modern, comfortable, with 2 bathrooms. Made with good taste, created to have a good rest! What we like the most it's a big terrase with sea view where we have our breakfest and spend a lot of time in the evening. Not far from there is a shop, some restorants. We have been buying fresh fish and ice creame from the car going round in this place. The sea water is so transparent. Very good location to see the sights (Etna, Gole dell’Alcantara, etc) and go shopping in Catania (it's necessary to have a car). Nuestra estancia en casa de Filippo fue muy agradable. El apartamento es muy amplio, limpio, cómodo, confortable y bien decorado. Tiene acceso directo al mar entre rocas de lava y a través de una escalera metálica anclada a las rocas lo cual facilita el baño. La terraza con vistas al mar es maravillosa para descansar, desayunar o simplemente disfrutar del amanecer o del atardecer. La relación con el propietario fue cordial y fluida, y en todo momento estuvo disponible. Muy recomendable!!!! Großzügige Wohnung über 2 Etagen, tolle Dachterasse mir Meerblick, funktionale Ausstattung, sauber, idealer Ort zum Ausspannen, tolles Fischrestaurant in 100 Meter Entfernung, sehr nette Vermieter, unkompliziert, immer ansprechbar. Jederzeit gerne wieder. An den leider erlebten Regentagen vermissten wir den gemütlichen Wohnkomfort im Wohnzimmer, deshalb nur 4 Sterne. Located in the northeast of Acireale and lies at the foot of the Timpa, Santa Tecla is now a seaside resort and residential. From the sixteenth century because of some raids of Turkish pirates was equipped with a sentry on guard, which nevertheless failed to defend the village from pirate Luccialì, that right there landed May 3, 1582 under the command of seven galleys and three hundred pirates . The small town is a quiet seaside resort for families and for those who love the clean sea. Post a strategic location provides easy access to major centers like Acireale (2km), Catania and Taormina in a short time.